What Exactly Is Neoprene and Why Is It Waterproof? 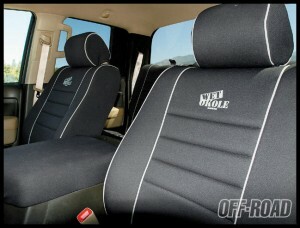 At Wet Okole, we create seat covers to protect your vehicle’s seats from water and UV damage. These seat covers are incredibly useful for anyone who frequents the beach or the pool. Having passengers jump in the car when they are not fully dry is a surefire way to begin damaging your seats. The water from you or your passengers’ clothing will be absorbed by your seat’s fabric. Eventually, this continual water absorption will degrade the fabric of the seat or discolor it. If you’ve been to the beach, saltwater can absorb into the seat’s fabric and then dry out leaving salt deposits in the actual fabric. All types of water are also harmful to leather seats as well. So what we’ve done is create a “wetsuit” for your car’s interior. Our seat covers are made from neoprene which is a water resistant material. So what exactly is neoprene? First, let’s get the science out of the way. Neoprene is made by free-radical polymerization of chloroprene. Let’s break that down a bit. Polymerization is a process of reacting monomers (a molecule that can be bonded to other identical molecules) together to form a polymer through a chemical reaction. In this case, the monomer is chloroprene, which is a colorless liquid, and the chemical reaction is initiated with potassium persulfate. The end result is the neoprene, also known as polychloroprene, the polymer. You are now ready for your chemistry exam. In simpler terms, neoprene at its core is a synthetic rubber. The synthetic rubber is often sold as manufactured and sold as solid rubber or a latex form. It can also be formed into an open or closed-cell foam. The open-cell foam is breathable. However, the closed-cell foam is waterproof making it very applicable for aquatic based activities. Not only is neoprene great for aquatics because of its waterproof properties but also because of insulation against the cold. For example, fly fishers use neoprene waders which provide a waterproof cover and insulation from standing in the water for long periods of time.